A few days ago I posted a photo of what may be the largest bunch of kale I've ever seen, picked up at the Wednesday Dane County Farmers Market. I then proceeded to ask all of you (via Facebook and Google+) what you like to do with your kale. I thought I would share some of your responses, since you all jumped in with such great ideas. While I'm still working through my two bunches, as well as trying out all of your suggestions, I thought I would also share my new favorite breakfast recipe - a poached egg on a bed of steamed greens, layered on a slice of bread with cheese. This was so good that the first time I made it I ate it again for lunch :) It also takes almost no time at all to make, which means that not only is it crazy nutritious (protein from the egg, tons of nutrients from the kale, carbs from the bread, calcium and good fats from the cheese and so on), it makes for a super easy breakfast you can have any day of the week. Make extra greens and have it again tomorrow! It will only cost you the time it makes to boil some water. It's a fairly loose recipe, since I just toss it all together to taste, and it depends on how much kale I steam at a time, but I'm sure you'll find it easy enough. 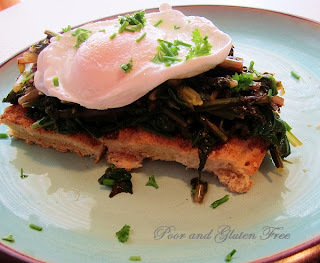 Also, this works well with a variety of other greens - I've done it with dandelion greens (seriously! I bought a bunch of organic dandelion greens a while back and they were delicious done this way), beet tops, swiss chard, and various combinations of these with kale. 1. 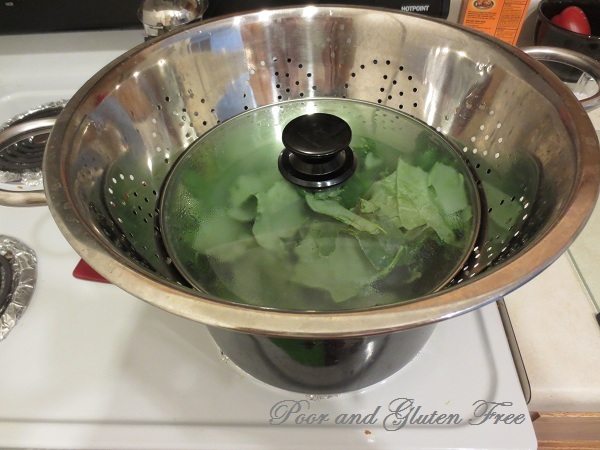 Use a steamer, or a metal sieve set up over a pot with a small amount of boiling water. To do this, take a large pot, add about 2 inches of water in the bottom, place a large sieve over the pot (do not let the water touch the bottom of the sieve) and add the greens. Place a large pot lid over the greens. 2. Steam the kale for 2-3 minutes, until bright green and wilted. Move to a bowl and mix in the lemon juice, salt and pepper and butter to taste. 3. Layer the bread with cheese, then arrange the greens on top. Poached egg, ready to eat! 1. 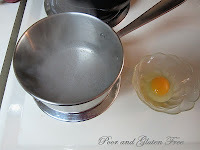 Bring about 2 inches of water almost to a boil (I use the same water from the steamer pot to make it easy and quick). 2. Add the white vinegar to the water (the vinegar is necessary, it will help the egg to float), then slip the egg in to the water. I find this is easiest to do by cracking the egg into a small bowl, then using the bowl to slip the egg in to the water. 3. 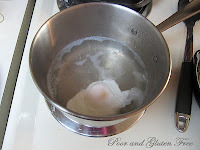 Let the egg simmer until the white is solidified and the yolk has just begun to cook. Using a spoon, periodically scoop water over the egg to cook the top. Use a slotted spoon to scoop out the egg and place onto the rgreens. And here is the list of your suggestions! I can't wait to try some of these out, so thanks for sharing!!! * Tossed in oil and sea salt and dried in the dehydrator is great! *OAS Information: This recipe is free of all the major allergens listed on the Oral Allergy Syndrome charts that I have found. I can't seem to poach an egg for the life of me. I will try yet again. I guess I am egg poach impaired. If it still doesn't work, let me know what went wrong and I'll try to help you out :) I used to be intimidated by poached eggs too, until I suddenly got the hang of it and now it seems fail-proof. We would have to leave the egg off due to allergies, but I'll bet it would taste just as good without it! 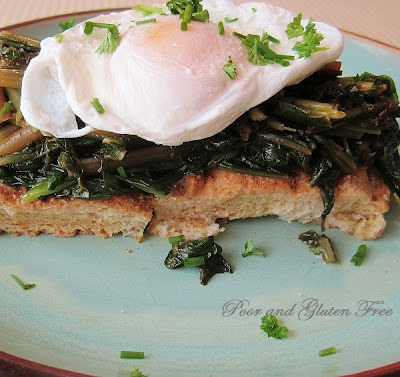 Looking forward to trying this recipe out and thank you for sharing this week in our linky. Have a wonderful weekend!